Floating House W/3 Bedroom, 2 Full Bath, Sleeps 8-10, Attached Boat Dock. This amazing property boasts one of the best views in all of Lake Norris--a pristine mountain right off the front porch! You will have all the comforts of home while enjoying immediate proximity to Lake Norris. This three-bedroom, two-full bath house with two-premium air mattresses affords all the amities of home. PLEASE NOTE: YOU WILL NEED TO BRING YOUR OWN BOAT AS THIS HOUSE IS LITERALLY FLOATING IN THE MIDDLE OF AND IF YOU DO NOT HAVE A BOAT YOU WILL BE UNABLE TO ACCESS THIS HOUSE! Laura Shade is a neonatal nurse practitioner for Riley Children's Hospital in Indianapolis, Indiana. Laura has been in the business of helping the sickest babies fight for their lives since 1984. She loves helping others and enjoys above all else spending time with her wonderful children, grandchildren, and great-grandchildren. She enjoys reading, boating, and antiquing. This is her first year renting out her beloved vacation home, and is confident you will love it too! Jimmy Conroy II, Laura Shade's son, is an executive for etrailer Corporation. out of Wentzville, MO, and a recent graduate of Capital University Law School in Columbus, Ohio. Jimmy is helping Laura this year as she make the transition from full-time vacation home owner to a rental property owner.. Jimmy loves all things boating. He has a 3 year old daughter named Ali who also loves the water! Jimmy is an avid book collector and enjoys learning, good conversation, and fine dining. In 2005 when this house was built, Laura Shade had her pick of any spot at the marina. This home was one of the first in this area known as Powell Valley, and she loved the mountain view making sure to set her home right in the middle of the cove. This house allows for family and friends to travel by boat everywhere they go, while enjoying all the natural wonder of Lake Norris. The kids can step out of their beds and jump off the diving board into the water. It is an ideal location for families, friends, or business associates. This property is a great value and easily accessible from I-75. Also, La Follette, TN, is a quick 10 minute ride so anything you need of forget to bring is an easy trip to town. Many people make this their annual summer vacation destination, and all of the amenities of home can be easily had in the various shopping destination. Also, Knoxville, TN is 45 minutes further down I-75 and should you want to take a day trip to see Univ of Tenn it is an easy trip. You are ~4 hours from Cincinnati, and approximately 5 hours from Columbus. The traffic on i-75 typically flows at 80 mph. This house has an unobstructed view of the Powell Valley, and you are free to use all that is onsite at the property. This house is a great place to entertain with friends and family, and serves as a great "home base" for those that enjoy, as we do, spending their days out adventuring on boats. You must bring all your own towels, food, soap, etc. but all the infrastructure is in place for your use. Also, and most importantly you MUST BRING YOUR OWN BOAT, as without a boat you will be unable to access this property as it is floating 1/4 mile into the bay in 100 feet of water. Thanks for looking! toilet, combination tub/shower, Both bathrooms have water flushing toilets. YOU MUST BRING YOU OWN TOWELS--THERE IS A WASHER AND DRYER FOR YOUR USE ON THE PREMISE. Positioned inside of Powell Valley Marina so you will have all the access you require to fuel, ice, and other miscellaneous sundries. Close enough to not require a long drive on rural mountain roads, but remote enough to enjoy peace and quiet of this rural setting. You get the best of both worlds with this hidden gem! Right out the front door lies a beautiful and majestic tree-filled mountain. Ski right up to the dock on your waterskis, jetski, tune or wakeboard. It is physically impossible to get any closer to the water than this floating paradise. Positioned on beautiful Norris Lake, in the pristine beauty of this natural wonder. No houses in front make for an unimpeded view of the mountain and bay. It does not get any better on Norris Lake. Must provide your own soap. Must provide your own dryer sheets. Parking of cars is at the main marina. Plenty of spots to tie up boats around house. Also have a jet ski ramp should you have a personal watercraft. Must provide your own detergent. Coffee maker is a typical drip-style machine. Can make 12 cups at a time. Fully stocked with cups, dishes, utensils, cooking wares, etc. YOU MUST BRING 100% OF THE FOOD YOU WANT TO CONSUME DURING YOUR STAY. One TV in main living-room not connected to cable. Lots of VHS and DVD's, especially a nice selection of classic Disney movies for kids. There is a diving board connected to the deck to dive into the lack with an aluminum access later. Free to use the various noodles and rafts on site. While staying in our home you will truly be our guest! We hope you have a wonderful stay, and ask that you please respect our home as if it were your own. We also take a moment to remind you here that you must bring all your own towels, soap, food, life jackets, etc. and NOTE: THIS PROPERTY DOES NOT HAVE INTERNET OR DATA--ISP STOPPED PROVIDING SERVICE TO THESE FLOATING HOUSES. ALSO YOU MUST HAVE A BOAT TO USE THIS PROPERTY! IF YOU DON'T HAVE A BOAT THIS IS DEFINITELY NOT THE PROPERTY FOR YOU. Thank you again for your time and happy vacationing! The house was a lot nicer than the pictures! Deck needs a few updates but it did not interfere with our stay!! Jimmy always wrote me back immediately with any questions I had and the house was equipped with everything! Absolutely wonderful 4 days there!!! The view on the lake is as wonderful as described! We had a fabulous time. It is great to be right on the water without the time and hassle of tying up a house boat. There was some confusion with our reservation that had me worried but I did finally get the access information the day before we left and the wonderful family at the marina took care of the cleaning for us. Dishwasher was broken and deck repairs were scheduled. None of this got in the way of our wonderful experience. They definitely had a large selection of movies especially for children. They also have a very nice selection of water toys to share. Kitchen was very nicely stocked. Be sure to bring towels (not included), trash bags and paper products (not sold at the marina although they were very accommodating). You can also shower, use washing machine etc. without worrying about running out of water! Floating house in a wake free zone beats a house boat in my opinion. Great view, good fishing, clean & comfortable. Some minor maintenance needed. lovely home, plenty of room for the 4 adults and 2 children on our trip. The kids loved swimming right off the front while the adults relaxed on the porch. The house was well equipped, no issues with any appliances. TV was for movies only, but home has a good supply. Our only problem was finding the house upon our arrival in the dark. Friendly neighbors helped. The owners are fantastic and also responded quickly to me via text. I honestly believe it has the best view on the lake. We have stayed here two years in a row now and will plan to go again next summer. We would love to buy this house! Well we left a day early. The first three days we had a terrible smell off sewage when swimming off the front of the house. Ends up the septic was full & over flowing into the water. Likely could have been resolved the first day with a pump out of the septic but we could not get the owner to answer & order this service. Do not plan on using any of the water toys other than the paddle boat as they are locked up. The house & the location worked well for a party or a family. Norris Lake is a beautiful scenic escape for thousands of families and visitors every year. The breathtaking rolling hills frame the perfectly placid and amazingly clear turquoise-green deep waters. Lake Norris is truly a rare and treasured find for those seeking its picturesque majesty. 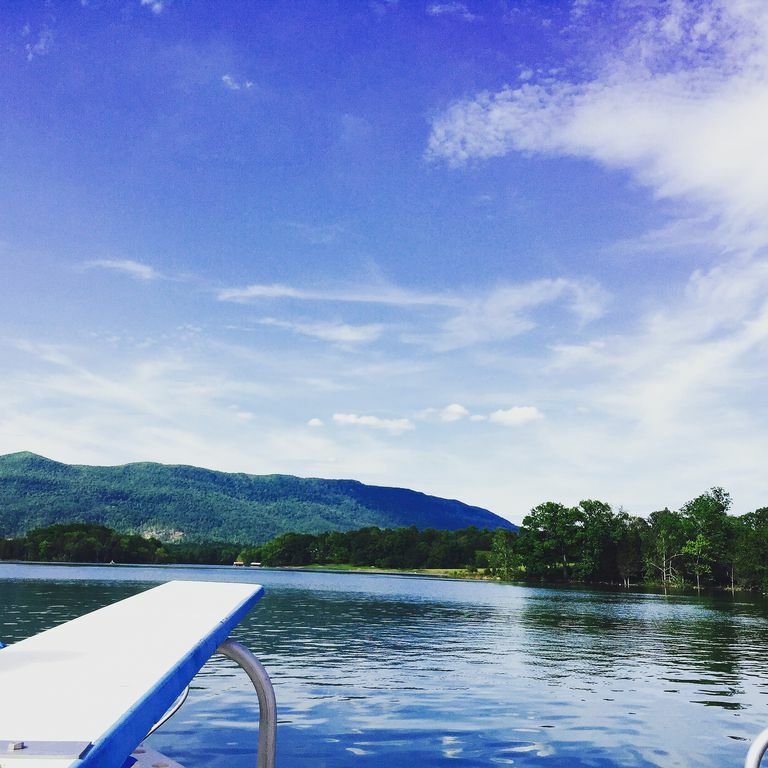 Norris Lake is one of the greatest areas for fishing, swimming, vacationing, boating, tubing, wakeboarding, water skiing, kayaking, canoeing, hiking, trails, camping, and just having an amazing time. Whether it is relaxation and peace that you seek or a new adventure with outdoor beauty to explore, the areas surrounding this lake will entice you to return again and again, year after year. You will always find something new with every visit. Norris Lake hosts many hidden private coves along its long and winding shores as well as miles and miles of hiking trails through the hills. Plenty of water and land to explore as you set off for an absolutely amazing vacation. The beautiful "House on the Lake" is right in the heart of this region, offering the easiest of commutes to access Lake Norris. Located 22 miles from the I-63/I-75 junction you will not have to navigate any mountain roads to access the house. You will enjoy the majesty of a rural location, but not the hassle of a long drive should you require supplies from La Follette. This home has never before been rented, so enjoy a clean and fun family environment. PLEASE NOTE: YOU REQUIRE A BOAT TO ACCESS THIS PROPERTY! IF YOU ERROR AND DO NOT REALIZE THIS AND ARRIVE AT THE PROPERTY WITHOUT A BOAT THE GENERAL CANCELLATION PROVISIONS STILL APPLY. THE UNIQUE AND FLOATING NATURE OF THIS HOUSE HAS BEEN CLEARLY DESCRIBED IN MULTIPLE PLACES THROUGHOUT THE ADVERTISEMENT.